Braeside (named for Scottish word for hill – “brae”) is situated on the Ottawa River, up-river (west) from Arnprior, Ontario. All 4 volumes provide information on Braeside and the Braeside WI from the 1860’s - 1980’s. 1. History of settlement including maps, newspaper articles and hand written accounts. 2. 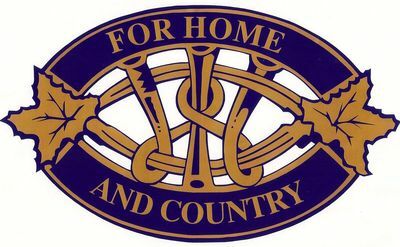 History of Braeside WI, including community involvement, District & Provincial activities and celebrations, Sister WI (England) correspondence, etc. The Volume entitled “History of the Village” has a Table of Contents [page 3], although the numbering is slightly off. "Braeside has only one industry, Gillies Bros. Lumber Mill. 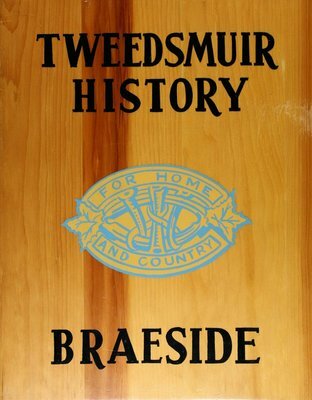 Therefore, it was decided by the curator, Mrs. Forrest Merrifield and her committee, Mrs. Phil Armstrong and Mrs. James Beattie, that a cover of wood was the most appropriate for the village Tweedsmuir History. Mr. Erwin Graham, a carpenter in the village and an employee of Gillies Bros., donated the wood and made the cover in June, 1964. Braeside Women's Institute bought the binder fixtures. Ray Rouselle of Arnprior did the lettering and painting on the cover."